It's Thankful Thursday and my friend Iris of Grace Alone is hosting. I'm writing this one before I have the chance to see what Iris will choose as our thankful Thursday theme. I feel compelled to share about ...HOPE! These are challenging times in our world today. I read about people who have marriage problems, financial problems, health issues, death and ...taxes. These are very real problems. I do understand better than many may know. The reality is that we live in a world that's been mired and soiled by sin ever since Adam and Eve. But as a Christian, I know this isn't my real home. I'm just passing through. And one day when my life here is over, I will find that in terms of time it was just a blink of an eye. It helps me to keep perspective. Then when people ask me how I can deal with the issues I'm going through, I can point to my relationship with Jesus. That is the reason I can have HOPE! And I always try to do it with gentleness and respect. As I go through my trials, I want to stay close to Him. When I listen and obey then ...He will get the glory! 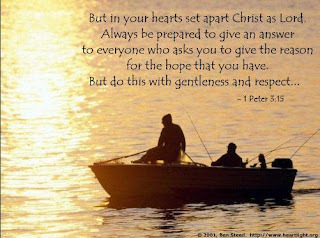 Remember Peter who eagerly began to walk towards Jesus on top of the water. When he kept his eyes on Jesus ...he was fine. But when Peter chose to take his eyes off of Jesus and looked down at his circumstances ...he began to sink. Where do you choose to focus in the midst of these challenging times? On this Thankful Thursday, I choose to be thankful for HOPE. And the object of my hope is ...Jesus. You can visit other Thankful Thursday posts by linking to Iris at Grace Alone. Wow! it's amazing how you're theme has coincided with Iris' theme for the week, even without knowing it. This is a very inspiring post.. Thanks for sharing! Thanks for visiting my thankful post! God indeed is telling us something about HOPE, becoz it was also Iris's theme. HOPE in HIM is what keeps us strong. so true. very well said. God bless you, debbie. Love nothing of this world and allow His love to hold us up! Allow the hope in Jesus Christ - who is always good, faithful and true to be our guide in this life! Amen, when you world tries to get me down, I just look to Him! Coincidence? I think not...Our hope is in Jesus!! Beautiful post, my friend. So very true and good to remember! Thanks for you kind comments on my blog. "Hope is a good thing, maybe even a great thing"! Amen...it is my prayer and goal to live more fully for Christ and to recognize His blessings each day. Blessings Debbie & so well written! Beautiful! Our HOPE is made stronger through these challenges and oh YES, we can share that the reason we CAN make it through this mess & mire of hopelessness is our HOPE in Christ! How well He defines each of our steps of faith & leads you to HOPE and Iris too! Divine plan! Love your inspirational writing & chose of scripture with the graphic! Thanks! Hi there, What a wonderful post-so true and you are such a faithful witness for Jesus. Hugs to you this evening. I'm walking on the water with you my friend. Sometimes completely focused, sometimes allowing the waves to distract me. How wonderful it is that we do have hope because of the promises of our Lord Jesus Christ. Without that, we could all be depressed with all that is going on in the world today. Thanks for writing about it. Thanks for visiting my first TT post; I didn't even realize they had specific themes. I've enjoyed reading so many posts about hope - it is very encouraging.